Episode 218: Ending Homelessness with Homes – Housing First! You can listen to this episode above and subscribe to our podcast on iTunes. You can also listen to this episode on Stitcher, Cyber Ears or download it on Archive.org (61mins, 50MB). This episode features Launch Housing CEO Bevan Warner on the “housing first” approach to addressing homelessness. You can donate to Launch Housing to support those sleeping rough to get into safe, long-term housing, check out The Australian Homelessness Monitor – commissioned by Launch Housing to give insight into the current state of homelessness in Australia and look into the Everybody’s Home campaign which calls for a better, fairer housing system for everyone. We also play part of an interview we did with Kelly from the Roominations show on 3CR at the #PublicHousingParliamentaryVigil – which we covered last episode #217. You can watch this full interview on Youtube, Facebook and listen to the whole thing on Soundcloud. You can also hear Kelly discussing homelessness on our 160th episode. Finally, we play an interview Nick did on ABC Radio Tasmania with Melanie Tait on the issue of dogs being considered property under the law. This interview is based on Nick’s article on the ABC ‘The perils of pet ownership: your dog isn’t a ‘fur baby’, it’s your property’. If you’d like to hear more on this issue, check out Nick’s discussion on ‘Pets and Animal Liberation’ with PhD candidate Zoei Sutton – on Freedom of Species radio show on 3CR. The show also has an overview of @tasaanimals session from #TASA2018 – discussing talks by @ylaingylaing & Katherine Calvert. Adam Ruins Everything ‘Adam Ruins Housing’ (season 1, episode 19), Bomb the Music Industry ‘Slumlord’, Interview with Launch Housing CEO Bevan Warner, Interview with Kelly from the Roominations show on 3CR, Interview Nick did on ABC Radio Tasmania with Melanie Tait, Lowkey ‘The Death of Neoliberalism’. Episode 217: Public Housing – Everybody’s Business! Image from the ‘Public Housing – Everybody’s Business’ Facebook page (link below). You can listen to this episode above and subscribe to our podcast on iTunes. You can also listen to this episode on Stitcher, Cyber Ears or download it on Archive.org (19mins, 18MB). This episode features Dr Joe Toscano on the vigil for public housing, which is running continuously, 24 hours a day, on the steps of Parliament House in Melbourne (corner Bourke St and Spring St) from midday on the 14th of November until 12am on the 24th of November, the day of the Victorian election. Come by when you can if you’re in Melbourne! *Update: since we released this episode we’ve done another interview giving an update on the action a few days in – featuring Kelly from the Roominations radio show on homelessness. You can check out that interview – video here and below and also audio only. Facebook event page for this vigil. Facebook page to like for updates etc: Public Housing – Everybody’s Business. 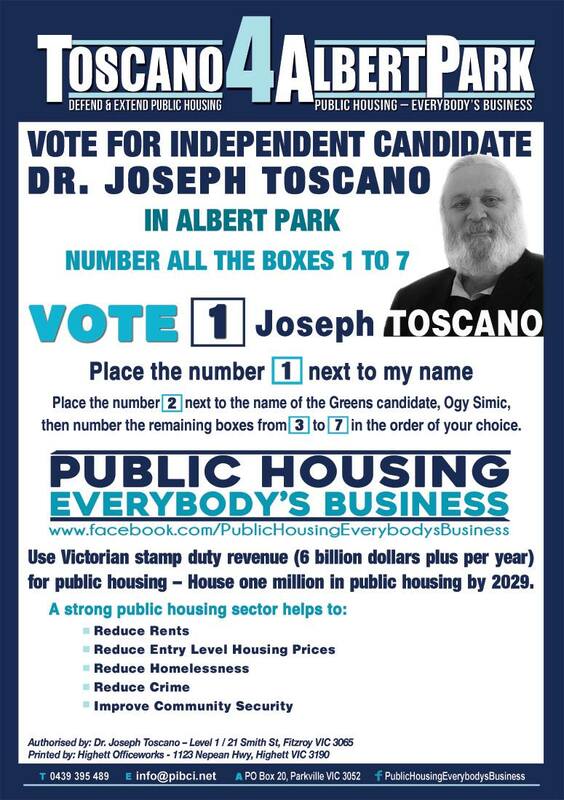 Joe’s campaign as an Independent candidate for Albert Park in the upcoming Victorian election. Joe’s podcast Anarchist World This Week. Roominations radio show on homelessness – which will cover this vigil on the 15th and 22nd of November shows, 12-1pm (Melbourne time) – listen in live on 855AM from Melbourne or via 3cr.org.au from anywhere. Plus you can listen back to the episodes after they air at the link given. Ramshackle Glory ‘From Here to Utopia’ and ‘Bitter Old Man’. Image from the ‘Public Housing – Everybody’s Business’ Facebook page (link above).